"A woman wears many hats—daughter, sister, best friend, unstoppable career woman, mom... Your days are filled with responsibilities, good times, hard work and (hopefully!) a few precious moments just for yourself every now and again—experiences that all add up to a wonderful and fulfilling life! A Miche Bag is just like you—It can be sweet as honey, sassy as can be, or sleek and business-like. The choice is always yours. We understand that a woman's purse is her most important accessory, so we've made it a snap (really!) to change your bag's personality whenever you feel like it—in mere seconds. Always chic. Always convenient. Always affordable. Always there for you no matter what hat you're wearing today. It's your new favorite accessory. So you. So now. So Miche." I really LOVE Miche bags! I love the fact that you can choose from so many designer handbags at extremely reasonable prices. Miche bags make purse shopping much more affordable than other brands because you have one base bag, and purchase different shells for the base so that you can easily change your look without spending a ton of money! Is it classic? Is it edgy? We think the Melody Slip-On Shell for Classic Bags is a little bit of both and sings a unique tune all its own! 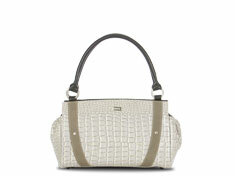 Soft glossy lizard-print faux leather in shades of cobblestone grey is perfectly offset by curving slate-colored accents. Melody boasts a posh look that transitions effortlessly from office to evening. To purchase your own designer handbags by Miche Bag, check out the endless possibilities available at http://www.michebag.com/. Also, be sure to follow Miche Bags on Facebook and Twitter to keep up with all of the new shell designs coming out each month!